While Annaliese dabbles in many different art forms and mediums, it was the love of wine that inspired the creation of her Art Bra. “Wine is something my MIL and I have bonded over,” Annaliese says,”Debi Martin is my guru, for sure!” So, using fabric, foam, corks, beads, sewing notions and wire, she set about to construct a bra that was sparkly, whimsical and a little sassy. “It’s a tribute to the strength and wisdom of women who have overcome adversity, and the attitude it takes to get through some days. And sometimes wine may be part of the equation,” Annaliese says. 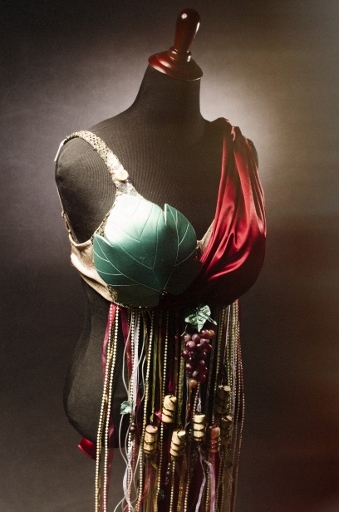 What resulted is a hybrid of Greek mythology, belly dancing and wine drinking — all working together to create a fun, colorful and bold bra that Debi Martin will surely model with style. Cheers! A longtime hairdresser, Sylvia says that art and creativity have always been a part of her life. And since two of her 5 sisters are breast cancer survivors, Sylvia took the opportunity presented by Art Bra to create a piece for Angie Garza, her sister who is a 1-year survivor. Inspired by the song “Copacabana” by Barry Manilow, Sylvia used beads, chiffon, tulle, lace and sequined material to create a vibrantly colorful south-of-the-border bra that serves as a celebration of victory.